Reference for consultations and motives for accepted and rejected comments and recommendations on the Report on Strategic Environmental Assessment of OPIC 2014-2020. Annual reports on the implementation of OP "Competitiveness"
Examples of successfully implemented projects under OP "Competitiveness"
The first 202 grant contracts under Operational Programme „Innovations and Competitiveness” (OPIC) 2014-2020 will be signed until Christmas. This was announced by the Minister of Economy, Bozhidar Lukarski on a press-conference, which presented the results of the evaluation of project proposals, submitted within the first deadline of OPIC procedure “Improving the production capacity in SMEs”. On 1st July, 2015 in Sofia was held the first meeting of the thematic working group for development of the new Operational Program “Initiative for Small and Medium Enterprises” 2014-2020. (OP ISME). The meeting was chaired by Mrs. Ivelina Peneva, acting Director General of the General Directorate “European Funds for Competitiveness” in the Ministry of Economy and Chairlady of the Thematic Working Group. The Ministry of Education and Science and the Ministry of Economy organize information days in the planning regions where the new opportunities for financial support under the Operational Program “Science and Education for Intelligent Growth” and under the priority axis 1 “Technological development and Innovations” of the Operational Program “Innovations and Competitiveness” 2014-2020, shall be presented. The role of the Innovation Strategy for Intelligent Specialization 2014-2020 is under discussion for both Operational Programs. An updated Operational Manual for implementation of contracts signed under the call for direct awarding of financial grant aid BG161PO003-1.2.05 „Establishment of Hi-tech Park”, version 2 and attachments to it was approved by Order № РД-16-435/28.05.2015 of the Minister of Economy and Head of the Managing Authority of OP “Competitiveness” 2007-2013 was approved. On 28th May, 2015 from 11:00 till 20:00 h in the City garden of Sofia (the ex-Mausoleum area) shall be carried out an exhibition/presentation under the heading “One direction, many opportunities”. The event shall bring together experts from all operational programs for the period 2014-2020 who shall provide information and promotion materials for the current calls for proposals and general information on the programs. The Operational Program “Development of the Competitiveness of the Bulgarian Economy” 2007-2013 shall present good practices of projects that have already been completed. Ms. Corina Kretzu, European Commissioner of Regional Policy shall attend the event and is expected to visit the presentation desks of the programs at 18:00 h.
A Manual for Implementation of Financial Aid Contracts under the Operational Program "Innovations and Competitiveness” 2014-2020 was approved by/BG/ Order № РД-16-411/19.05.2015 of the Minister of Economy and Head of the Managing Authority of the Operational Program “Innovations and Competitiveness” 2014-2020. Bozhidar Loukarski – Minister of Economy inaugurated the information campaign on the first call for proposals opened under the Operational Program “Innovations and Competitiveness” 2014-2020 today in Vratza. BG16RFOP002-2.001 „Improving the Production Capacity of SMEs”. The objective of the call for proposals is provision of investment support to Bulgarian small and medium sized enterprises (SMEs) for improvement of production processes and for enhancement of production and export capacity. The Operational Program “Innovations and Competitiveness” 2014-2020 (OPIC) is the basic program document on national level outlining the aid envisaged for the Bulgarian business from the European structural and investment funds for the period 2014-2020. The Program’s main objective is the achievement of dynamic and competitive economy through the development of innovations, entrepreneurship, growth capacity of small and medium-sized enterprises (SME), energy and resource efficiency of enterprises. The total budget of OPIC amounts to € 1,39 billion, with financing from the ERDF almost € 1,18 billion (85% of the budget ), and national cofinancing € 209 million (15% of the budget). On 1st October, 2014 in Sofia Hotel Balkan, in Sofia was held the fourth session of the thematic working group for development of the Operational Program “Innovations and Competitiveness” 2014-2020 (OPIC). The meeting was chaired by Mrs. Irena Mladenova – Deputy Minister of Economy and Energy and Head of the Managing Authority of the Operational Program. IMPORTANT!!! Dear beneficiaries, by Decision РД-16-1284/24.09.2014 the Head of the Managing Authority of Operational Program “Development of the Competitiveness of the Bulgarian Economy” 2007-2013, amended Decision РД-16-250/26.02.2014 for the adoption of Instructions on the conditions and order for selection of contractors by beneficiaries of financial grant aid. Following Art. 7, Para. 3 of Decree № 107/2014 of the Council of Ministers, the Managing Authority of Operational Program “Innovations and Competitiveness” 2014-2020 published a draft version of an Indicative Annual Work Program for 2015. IMPORTANT!!! The Managing Authority of the Operational Program “Development of the Competitiveness of Bulgarian Economy 2007-2013” published Instructions on the application of Art.9, para. 2 of Council of Ministers Decree No. 118/2014 relating to the provisions and order for selection of Contractors by beneficiaries of financial grant aid from the European Regional Development Fund….. The Call for proposals BG161PO003-2.1.14 „Technological Upgrade of Small and Medium-sized Enterprises“ (announced by Decision № РД-16-1462/22.10.2013 of the Head of Contracting Authority, modified and amended by Decision № РД-16-646/14.05.2014) was cancelled by Decision № РД-16-860/23.06.2014 of the Head of the Managing and Contracting Authority of the Operational Program “Development of the Competitiveness of the Bulgarian Economy” 2007 – 2013. The latter Decision repealed Decision № РД-16-694/23.05.2014 by which the Head of the Contracting Authority of OP “Competitiveness” had approved the Evaluation Committee’s Report on the evaluation carried out under the open call for competitive selection of project proposals with fixed deadline for applying: BG161PO003-2.1.14 „Technological Upgrade of Small and Medium-sized Enterprises“, Priority axis 2 ““Increasing the Efficiency of Enterprises and Development of Favorable Business Environment” of the Operational Program “Development of the Competitiveness of the Bulgarian Economy” 2007-2013 and Appendix № 1 – List of Project Proposals approved for financing and Appendix № 2 – List of Reserve Project Proposals which successfully passed evaluation but failed to contract due to shortage of funds. The Managing and Contracting Authority of the Operational Program “Development of the Competitiveness of the Bulgarian Economy” 2007-2013 published a List of contracts signed under the procedure for Direct Awarding of financial grant aid BG161PO003-3.2.01 „Support for Initiatives of Acceleration & Seed Funds” under Operational Program “Development of the Competitiveness of the Bulgarian Economy” 2007-2013. By Order № РД-16-729/30.05.2014 of the Head of the Managing Authority of Operational Program “Development of the Competitiveness of the Bulgarian Economy” 2007-2013, amendments were made to the Guidelines for Applicants under the Call for Proposals BG161PO003-2.1.14 „Technological Upgrade of Small and Medium Enterprises” and the attachments thereto. On 20 May, 2014 the Council of Ministers adopted Decree No. 118 setting the terms and order for selection of contractors by beneficiaries of grant aid under the European Regional Development Fund, European Maritime and Fisheries Fund, EEA Financial Mechanism and Norwegian Financial Mechanism, promulgated in the State Gazette issue No. 44/ 27.05.2014, in force from 27.05.2014. By decision РД-16-250/26.02.2014 of the Head of the Managing Authority of OP Competitiveness, the Regulation providing for beneficiaries implementing grant aid contracts to collect at least 3 (three) offers with technical and financial provisions so as to comply with the principles of good financial management was repealed. On the grounds of the said decision, instructions for the new order to be followed by grant aid beneficiaries/candidates in all cases within the scope Art. 9, Para 2 of Council of Ministers Decree 69/2013, were published herein. The Managing and Contracting Authority of OP “Development of the Competitiveness of the Bulgarian Economy” 2007 – 2013 published an Updated List of the Contracts Signed under the open Call for proposals covering specific quality requirements without fixed deadline for applying: BG161PO003-2.3.02 „Energy Efficiency and Green Economy", under the Operational Program “Development of the Competitiveness of the Bulgarian Economy” 2007 – 2013. Updated List of the Contracts Concluded under the open Call for proposals BG161PO003-1.1.07 "Introduction of innovations in the enterprises". The Managing Authority of the Operational program “Development of the Competitiveness of the Bulgarian Economy” 2007-2013 extends an invitation to non-government organizations to take part in the selection of representatives of the non-government sector for the Monitoring Committee of Operational program “Competitiveness”. Publication of a List of project proposals suggested for rejection at the stage of administrative compliance and eligibility evaluation under the Call for Proposals for provision of financial grant aid BG161PO003-2.3.02 „Energy Efficiency and Green Economy”. ﻿By Decision № РД-16-119/31.01.2014 of the Head of the Managing Authority of OP Competitiveness the total budget of the Call for Proposals BG161PO003-2.4.02 „Support for the Development of Clusters in Bulgaria has been increased by BGN 10 000 000. The Managing Authority of OP “Competitiveness” extends the deadline for submission of project proposals to the Contracting Authority till 31.03.2014. List of contracts under grant procedure BG161PO003-1.1.07 "Implementation of innovations in enterprises". The Managing and Contracting Authority of Operational Programme “Development of the competitiveness of the Bulgarian economy” 2007-2013 published Updated List of contracts signed under an open call for proposals covering specific quality requirements without fixed deadline for application: BG161PO003-2.3.02 „Energy efficiency and green economy"
"European Funds for Competitiveness" Directorate General at the Ministry of Economy and Energy presented the annual awards „Competitive Bulgaria“ 2013 for most successful project under OP "Competitiveness". 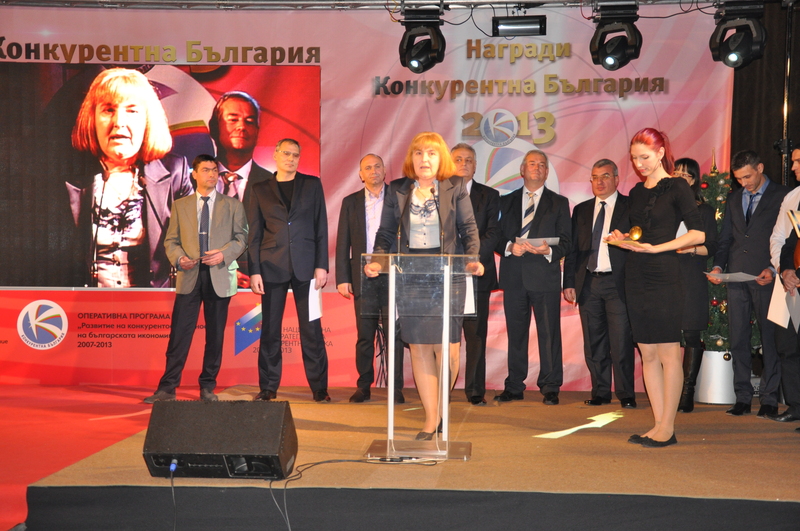 The award ceremony took place on 20.12.2013 in Hall 3 of the National Palace of Culture. By Order № РД-16-1776/14.12.2013 of the Director-General of "EFC" DG and Head of the Managing Authority of Operational Programme “Development of the competitiveness of the Bulgarian economy” 2007-2013 an amendment in Chapter III "Procedures for selection of a contractor"
﻿The Ministry of Economy and Energy shall present in Hall 3 of the National Culture Palace at 19:00 h on 20th December, 2013 the implementation progress of Operational Program “Development of the Competitiveness of the Bulgarian Economy” 2007-2013 within the framework of a big information event. 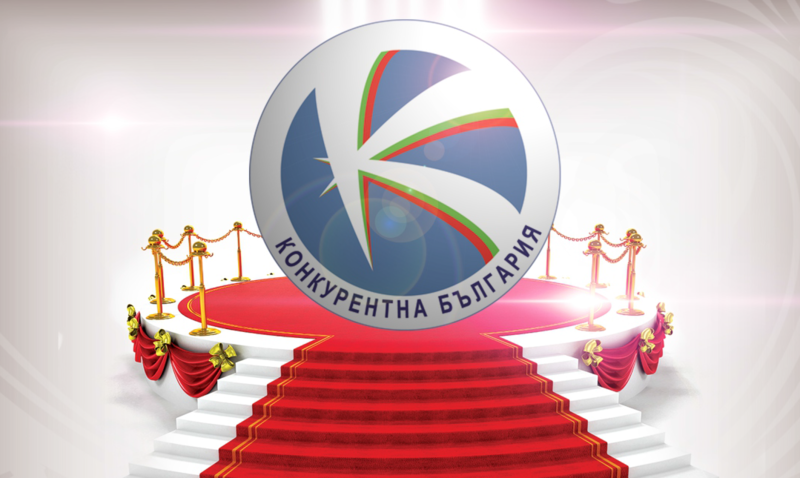 The annual awards “Competitive Bulgaria” for most successful project under the Operational program in 2013 shall be delivered at the official ceremony. By Decision РД-16-1749/09.12.2013 of the Head of the Managing Authority of OP “Competitiveness” the total budget of the grant financial aid under the Call for proposals BG161PO003-1.1.07 „Introduction of innovations in enterprises” was increased by BGN 54 903 858.16 for the category “ large enterprises”. By Decision РД-16-1715/05.12.2013 of the Head of the Managing Authority of OP “Competitiveness” the total budget of the Call for Proposals BG161PO003-1.1.07 „Introduction of Innovations in Enterprises” was increased by BGN 88 232 409.65. Decision № РД-16-1708/04.12.2013 of the Head of the Managing Authority of OP “Competitiveness” for approval of the 10th report of the Evaluation Committee for selection of project proposals covering specific quality requirements under an Open Call for proposals without a fixed deadline for applying. The Managing and Contracting Authority of Operational Program “Development of the Competitiveness of the Bulgarian Economy” 2007-2013 published an Updated List of contracts signed under the open Call for proposals for competitive selection with fixed deadline for applying: BG161PO003-2.4.02 „Support for the Development of Clusters in Bulgaria” under the Operational Program “Development of the Competitiveness of the Bulgarian Economy” 2007-2013 ”. In connection with Decision No. 698 of the Council of Ministers of 14th Nov., 2013 for the amendment of Decision No. 945 of the Council of Ministers of 2012, for the rearrangement of the days-off in 2013 (promulgated in the Official Gazette, issue 91 of 2012, further amended, issue 100 of 2013) and the arising necessity thereof for shifting the deadline for submission of project proposals under the open Call for proposals for competitive selection of projects with fixed deadline BG161PO003-2.1.14 „Technological upgrade in small and medium enterprises”, the documentation of the Call for proposals was adjusted accordingly by Order № РД-16-1665/28.11.2013 of the Head of the Managing Authority of the Operational Program “Development of the Competitiveness of the Bulgarian Economy” 2007-2013. A List of project proposals suggested for rejection at the stage of administrative compliance and eligibility assessment was published under the call for proposals BG161PO003-1.1.07 „Introduction of innovations in enterprises“. As a result of the measures undertaken by the Managing Authority of Operational programme “Competitiveness” no funds will be lost under the programme till the end of 2013. The Verification Assistant – Company under the Law on Obligations and Contracts „KPMG Bulgaria and ESD” (VA). The task of the VA is to verify the implementation of the project activities, which includes checking the final technical report and verification on the spot. The Contracting Authority reminds that the deadline for submission of project proposals under the Call for proposals BG161PO003-2.3.02 „Energy Efficiency and Green Economy” is 31.10.2013. In this connection applicants should take into account the time necessary for preparation of the project which covers a number of stages and activities: implementation of energy efficiency audit, carrying a procedure for selection of a contractor/supplier, preparation of the application form, obtaining the written technical opinion of the Project Assistant including the time required for corrections, obtaining the written statement of a partner-bank ensuring availability of funds as well as provision of a certificate by the National Statistics Institute on the economic activity code. By decision № РД-16-1211/04.09.2013 of the Head of the Management Authority of Operational programme “Development of the Competitiveness of the Bulgarian Economy” 2007-2013 the total budget of the Call for Proposals BG161PO003-1.2.04 „Development of the applied research in the research organizations in Bulgaria” is increased by BGN 18 566 979.57. In this way the overall amount of the financial grant is increased for a second time from BGN 35 700 637 to BGN 54 267 616.57. This will enable the financing of further 12 projects of the Reserve list of project proposals that have passed evaluation successfully. The Managing and Contracting Authority of Operational programme “Development of the Competitiveness of the Bulgarian Economy” 2007-2013 published a List of the contracts signed under the open call for proposals for competitive selection of project proposals with a fixed deadline BG161PO003-1.2.04 „Development of the applied research in the research organizations in Bulgaria” under the Operational programme “Development of the Competitiveness of the Bulgarian Economy” 2007-2013. Since 30th July, 2013 the European Bank for Reconstruction and Development has agreements signed with three more commercial banks, under the procedure BG161PO003-2.3.02 "Energy Efficiency and Green Economy". The Managing Authority of Operational Program “Competitiveness” and the European Investment Fund (EIF) extend an invitation to financial intermediaries interested in managing the instrument: Fund(s) for cofinancing within the framework of JEREMIE initiative. Walltopia Ltd., a company which is a world leader in the manufacturing of artificial climbing walls, honoured in the category “Market Leadership” of last year’s national innovation forum, received a Certificate for class A investor in the field of high-tech and innovation, for the establishment of a research and development – part of the “Collider Activity Center” of Sofia Tech Park. BGN 7.2 mln. is envisaged for the setting up of the R&D center from the BGN 15 mln. total amount of the investment. The joint project provides for the opening of about 100 new jobs. The Deputy Minister Krassin Dimitrov shall hand in an “A” Class Certificate to Walltopia Ltd. The ceremony shall take place on Friday, July 26, 2013, at 10:30 h in the building of the Ministry of Economy and Energy, at 8, Slavianska Str., Floor 3. An Updated List of the contracts signed under the Call for Proposals for provision of financial aid № BG161PO003-2.1.13 "Technology Upgrade of Small & Medium Enterprises” under the Operational Program “Development of the Competitiveness of the Bulgarian Economy” 2007-2013. With Order № РД-16-966/17.07.2013 (only in Bulgarian) of the Head of the Contracting Authority of OP "Competitiveness" the total budget of grant procedure BG161PO003-1.2.04 "Development of applied research in the research organizations in Bulgaria" is increased by BGN 16 142 337, representing the available resource under Priority Axis 1 of the Programme. Thus, the total amount of the grant under grant procedure BG161PO003-1.2.04 "Development of applied research in the research organizations in Bulgaria" was increased from BGN 19 558 300 to BGN 35 700 637. This will enable the financing of project proposals included in the reserve list, which have successfully passed the evaluation process, but did not reach funding. As of today, via the special section "Suggestions, comments, recommendations" on the website of the Operational Programme „Development of the Competitiveness of the Bulgarian Economy“ 2007-2013, the business will be able to send its suggestions, comments and recommendations for the new programming period 2014-2020, based on the experience / opinion about the present programme. This grant procedure is realized with the financial support of the European Union through the European Regional Development Fund. The indicative budget of the grant procedure is BGN 5 378 532, 50. The Managing Authority of OP „Development of the Competitiveness of the Bulgarian Economy“ 2007 – 2013 plans the launching of an open procedure for competitive project selection with a fixed deadline for application BG161PO003-2.1.14„Technology upgrade in small and medium-sized enterprises”. The Managing and Contracting Authority of OP „Development of the Competitiveness of the Bulgarian Economy“ 2007 – 2013 published: Actualized list of contracts under open call for proposals meeting specific quality requirements without fixed deadline for application: BG161PO003-2.3.02 „Energy efficiency and green economy" under Operational Programme „Development of the Competitiveness of the Bulgarian economy” 2007 – 2013. The Managing and Contracting Authority of OP „Development of the Competitiveness of the Bulgarian Economy“ 2007 – 2013 published: Actualized list of contracts under grant procedure BG161PO003-2.4.01: „Support for cluster development in Bulgaria”. ﻿The Managing and Contracting Authority of OP „Development of the Competitiveness of the Bulgarian Economy“ 2007 – 2013 published: Actualized list of the contracts under grant procedure BG161PO003-1.1.03 „Development of innovative start-up companies by support for commercialization of innovative products, processes and services”. By Order No ЧР-H-55/06.17.2013, at the position of Director General of the "European Funds for Competitiveness" Directorate General is appointed Mrs. Eli Milusheva. In connection with the provisions in the Council of Ministers Decision № 300/18.05.2013 concerning the possibility to increase the maximum percentage of advance payments to 65%, amendments in the Guidelines for Applicants under three grant procedures were made. On June, 4, 2013, in Interhotel Sandanski, the twelfth Meeting of the Monitoring Committee of Operational Programme “Development of the competitiveness of the Bulgarian economy” 2007-2013 was held. The meeting was attended also by representatives of “Regional and urban policy” DG at the European Commission and representatives of the European investment fund. Standard forms of documents for selection of contractors by grant applicants and by grant beneficiaries through a public call selection process in accordance with art. 7, § 1 of DCM 69/11.03.2013, approved by Order № RD-16-468/ 28.03.2013 of the Minister of Economy, Energy and Tourism. Pursuant to order № RD-16-446/22.03.2013 of the Minister of Economy, Energy and Tourism, the functions of Head of the Managing Authority of OP „Development of the Competitiveness of the Bulgarian Economy“ 2007 – 2013 will be performed by the Deputy Minister of Economy, Energy and Tourism - Mrs. Irena Mladenova. The Managing and Contracting Authority of OP „Development of the Competitiveness of the Bulgarian Economy“ 2007 – 2013 published „An updated list of contracts under grant procedure № BG161PO003-2.1.13 "Technology upgrade in small and medium-sized enterprises". The Managing Authority of OP „Development of the Competitiveness of the Bulgarian Economy“ 2007 – 2013 invites NGOs wishing to participate in the selection of representatives of the NGO sector in the Monitoring Committee of OP "Competitiveness"
A new Tariff about the amount of remuneration of external evaluators for participation in the evaluation of project proposals under grant procedures under OP "Competitiveness" and Order for its approval are published. On 15.02.2013 „European Funds for Competitiveness” DG at the Ministry of Economy, Energy and Tourism – Managing Authority of the Operational programme "Development of the Competitiveness of the Bulgarian Economy" 2007-2013 LAUNCHES a call for proposals: BG161PO003-2.4.02 „Support for cluster development in Bulgaria”. On 18.01.2013 pursuant to Art.14, § 5 of DCM № 121/31.05.2007 the Managing Authority of OP „Development of the Competitiveness of the Bulgarian Economy“ 2007 – 2013 published a draft of Guidelines for applicants and set of documents under open procedure for competitive project selection with a fixed deadline for application BG161PO003-2.4.02 „Support for cluster development in Bulgaria”. The Managing Authority of OP „Development of the Competitiveness of the Bulgarian Economy“ 2007 – 2013 plans the announcement of open procedure for competitive project selection with a fixed deadline for application BG161PO003-2.4.02 „Support for cluster development in Bulgaria”. As of 16 January 2013 the submission and evaluation of projects under procedure BG161PO003-2.3.02 „Energy Efficiency and Green Economy” will be performed by „Consortia TU-Technologies – Ruvex“ Association by DPA, selected for Project Assistant. A grant contract for establishing the first technology park in Bulgaria was signed today between the Director General of the "European Funds for Competitiveness" DG Kiril Geratliev and the CEO of Sofia Tech Park - Elitsa Panayotova. New address of Directorate General European Funds for Competitiveness within the Ministry of Economy, Energy and Tourism – Managing authority of OP "Development of the Competitiveness of the Bulgarian Economy" – Sofia, 21, "6-ti septemvri" str. Indicative Annual Working Programme for upcoming calls for proposals under the Operational Programme "Competitiveness" for 2010, including changes approved through a written procedure for decision making by the Monitoring Committee of the Operational Programme "Competitiveness"
The Ministry of Economy, Energy and Tourism and the Bulgarian Small and Medium Enterprises Promotion Agency (BSMEPA) lauch a call for proposals under the Operational Programme "Development of the Competitiveness of the Bulgarian Economy" 2007-2013. Project BG161PO003-5.0.01-0004 “Providing publicity and transparency of the activities under the Operational programme „Development of the Competitiveness of the Bulgarian Economy” 2007-2013” is being implemented with the financial support of the Operational programme “Development of the competitiveness of the Bulgarian economy” 2007-2013, Priority axis 5 “Technical assistance”, co-financed by the European Regional Development Fund of the European Union and from the state budget of the Republic of Bulgaria.